One of my absolute favorite working-mom girlfriends asked me for some salad dressing recipes the other day. First of all, let me just say that full-time working moms are ah-mazing. It is beyond me how you ladies get it all done. I'm in awe. Getting dinner on the table is hard regardless of whether you have kiddos or not, but little ones and a full-time job can make a homemade meal at a reasonable hour one of the most perplexing and frustrating daily struggles. I told my friend extraordinaire that keeping pre-washed greens and a jar of homemade salad dressing in the fridge is one of my favorite fast dinner tricks to ensure something green makes it on the plate. If everything is already prepped, throwing some lettuce in a bowl and tossing it with your own dressing takes literally 30 seconds. Plus, with the right dressing, a green salad is delicious and darn good for you too—healthy fats help you absorb the lettuce's nutrients, and making your own dressing is the best way to know you're eating high-quality ingredients. And if you make a jar of dressing once a week, the homemade kind is almost as easy as buying a bottle at the store. Plus, you made it yourself! Despite the fact that salad dressing is one of the things I make most frequently, the Anne food. recipe archive has been seriously lacking when it comes to the dressing department (as pointed out by the aforementioned, very astute girlfriend of mine). So here's one of my favorites to rectify the situation. Note: I've been known to dip fresh veggies in this dressing, pour it over brown rice and chicken, and drizzle it on sweet potatoes. Basically, you can use it for anything. Combine the shallot, sea salt, black pepper and acid in a jar. Stir and let the shallot macerate for at least 10 minutes (to get rid of the oniony zing). Then add the Dijon and olive oil, and shake vigorously. Anne food. has gotten the short end of the stick recently, mainly because I have been spending a lot of my time cultivating an exciting new relationship with Harney & Sons Fine Teas for a Foodstand campaign that launches this week! Many of you know that I'm the Content Editor at Foodstand, the anti-diet app that helps people develop long-lasting, healthy habits through fun, achievable Good Eating Challenges. And I'm excited to share our latest campaign with all of you. Join Foodstand and Harney & Sons Fine Teas for the World Health Day Challenge starting Friday April 7th! Help us reach our goal of avoiding 5,000 sugary breakfasts over the next week, and Harney & Sons will donate $5,000 to Wellness in the Schools. Simply download the free Foodstand app, follow the on-screen instructions to create a profile, and select the Avoid Sugar at Breakfast Challenge. If you're already a Foodstander, switch to the No Sugary Breakfast Challenge for a good cause. Tap the Settings icon in the orange My Challenge tab. Select "Change Challenge," and join the Avoid Sugar at Breakfast Challenge. Check in daily through Thursday, April 13th and you'll be entered to win tea prizes from Harney & Sons. Unhealthy diet is the #1 cause of premature death. Most American breakfasts contains more sugar that one should consume in an entire day—6 teaspoons (about 24 grams) for women and children, and 9 teaspoons (about 36 grams) for men. Even breakfast items marketed as health foods such as fruit yogurt, granola, cereal, energy bars and oatmeal packets are loaded with added sugar, and can set one on a disastrous path of cravings and crashes for the day. "It’s not just important to eat breakfast; it’s key to aim for a nourishing morning meal without added sugar to get the most nutrient-rich kickstart possible for your body and brain," explains Foodstander and nutrition expert Jackie Newgent, RD. Check out Foodstand’s blog 10 Better Breakfasts for fast, filling and tasty breakfast swaps to help you with your Challenge. Foodstand is thrilled to partner with Harney & Sons Fine Teas to help make healthy breakfast the default for all of us. Harney & Sons has been working with schools to increase the health and wellness of students since the beginning, and their teas and herbal infusions make for a delicious breakfast beverage without the added sugar. A better breakfast isn't just for adults, and Foodstand couldn't be more proud to work with Wellness in the Schools, the national non-profit that inspires healthy eating as well as environmental awareness and fitness in public schools. I hope you'll join me! You can find me on the app @annefood. Be sure to add me as a buddy so we can track each other's progress through the Challenge—people are twice as successful at building healthy habits if they do it with a friend. See you on the app! Salad or not, many folks find themselves faced with the daunting task of freeing those pesky seeds (aka arils) from their tough exterior and clingy pith. Pomegranates are super festive, look gorgeous, and taste delicious—they're great on top of Anne 'Nog, in sparkling water, or even in a glass of champagne. Many people suggest picking out the seeds in a bowl of water, but you always end up with a ton of pith left behind, plus it's a waste of water (let's face it, we're in a drought) and quite frankly it's annoying. Others suggest slicing out the sections. Still too time consuming—seriously, don't you have a turkey to cook? So here it is, the better way to seed a pomegranate. Take one of the halves and hold it cutside-down in a large mixing bowl. Push your thumbs on the knobby end and use your fingers to pull the edges of the pomegranate away from the center, loosening up the seeds a bit. Now comes the fun part. Hold the pomegranate cutside-down in your palm, whack the skin with a large wooden spoon, and watch with delight as the pomegranate seeds magically fall away from the pith and into the bowl. Rotate the pomegranate in your hand, making sure to whack all over the skin and release every last seed. Pick out the 2 or 3 bits of pith that fell into your bowl, and repeat with the other half. That was fun right? Plus you got to release all of your holiday stress on a piece of fruit instead of on your family. (You can thank me later.) If you're worried about juice sprays you can certainly put on your jacket and step outside before whacking away, but last night I successfully seeded my pomegranates without a single drop of juice escaping from my mixing bowl. Ready for the juice? If you've never had freshly-squeezed pomegranate juice, you have to try this. No, it does not taste like the pre-bottled kind you buy at the store. Do yourself a favor—it's delicious. Pour your freshly harvested pomegranate seeds into your blender, put on the lid (key step) and turn it on. Let it run for 20 seconds or so. Place a sieve on top of a liquid measuring cup (I use a two cup Pyrex), and pour some of the mixture through the sieve. Use the back of a dinner spoon to help push it through. Scoop the pulp out of the sieve and discard. Repeat until you've strained all of the juice—it only takes a minute or so. Mess-free, in barely any time at all. Let me know how it goes, enjoy your new party trick, and Happy Thanksgiving! 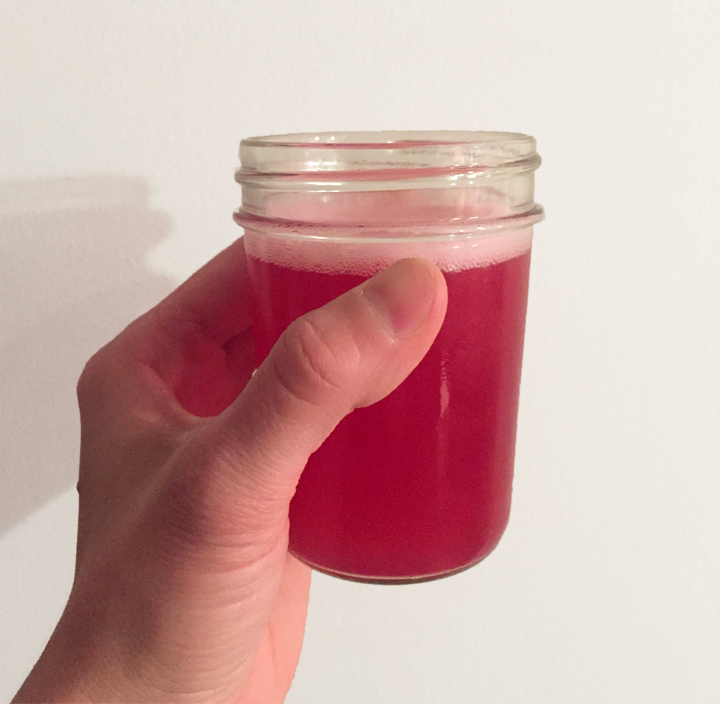 I had more juice than I needed, so I made myself a Pomegranate Spritzer to celebrate. Here's the recipe. Oh, before I forget—to clean your blender, simply fill it halfway with water and add a couple drops of dish soap. Put on the lid and turn it on. Yes, your blender cleans itself. Now you have even more reason to celebrate! Combine one part freshly squeezed pomegranate juice and three parts sparkling water. Drink, and enjoy. It's the most cliché thing to tell the bride and groom—enjoy your wedding day and don't worry about the details because it will be over before you know it. But it's true, and it's fantastic advice. You can plan until you're blue in the face beforehand, but when the time comes, the best thing you can do is make sure you're wearing comfortable shoes, let yourself laugh and cry, don't drink too much, and dance up a storm. You'll be sure to have the perfect wedding, regardless of whether it rains, snows, the tent collapses, or you run out of food. Actually, make sure you don't run out of food. That really would be terrible. In our case, the "wedding" lasted almost a week what with family visits, welcoming people to town, the rehearsal dinner, and a morning brunch. And we enjoyed every minute of it. But despite being a week-long affair, it really did go by like a flash. Luckily we have pictures to help us relive our celebration, time and time again. Since this is Anne food. after all, it seems fitting to share the most food-centric event with you—the rehearsal dinner we enjoyed with our immediate families, and everyone involved in our ceremony. All photography is credited to the wonderful Dev Khalsa, our wedding photographer, who kindly photographed our rehearsal dinner instead of doing an engagement session because we didn't want any "hipster photos with a horse in a field despite the bride and groom never having sat on a horse in their lives". (Those of you know know the ex-horse-jumper side of me might giggle at the irony.) This blog post would not be possible without her. And last but definitely not least, thank you to the always wonderful Kellee Havens of The Haven food truck who catered our backyard affair. You can read more about The Haven in my blog post from April 2015 here. Everyone gushed about the delicious fare all night. It was absolutely perfect, very us, and so so tasty. Thank you, Kellee. Without further ado, let the feasting begin! The Man and his food. A fun salsa is one of my favorite ways to dress up a protein. Last summer I shared my recipe for Stone Fruit Salsa that is perfect with grilled fish, chicken or steak. The smokiness from the grill is a great foil for the sweet fruit and tangy onion. And last spring I posted my Avocado Salsa that I serve with grilled or seared Ahi tuna. I love the creaminess of the avocado and the creaminess of the fish with briney capers and garlic. This Meyer Lemon Salsa is fresh and bright, with sweet Meyer lemons and shallots, and a lot of fresh parsley. This is a case where Meyer lemons are a must. Meyers are a cross between a true lemon and a mandarin, and are much sweeter and more tender than your typical lemon—you would likely find this salsa to be quite tart and overly chewy with either Lisbon or Eureka lemons. I intended to make this to serve with trout (I'm in Idaho after all), but there wasn’t any at the fish counter, so fresh, wild, red snapper was a great stand in. The salsa is really quite versatile, and would be perfect with halibut or salmon as well. Quinoa cooked in broth was a nice rich pairing for the bright salsa, and a green salad completed the meal. Note: I used red wine vinegar because that's what I had on hand in my tiny Ketchum kitchen, but feel free to use white wine vinegar or champagne vinegar instead. Cut the lemons in half, remove the seeds, and chop the lemons (skin and all) into 1/4 - 1/2 inch pieces. Combine them, as well as any juice from your cutting board, with the shallots and parsley in a bowl. Add a couple of splashes of red wine vinegar, and follow with enough olive oil such that when you stir it all together it’s quite moist, and the oil drips off of the lemons a bit. Season with a couple of pinches of sea salt, and a few grinds of black pepper. Stir to combine, and adjust seasonings to taste. I've been on 55 flights in 2015. So far. 16 in the last three weeks. It's pretty bad. I went from a Delta Sky Miles member, to Silver Medallion status, to Gold Medallion status in seemingly a matter of minutes. Which is great, except that the only time being a frequent flier is helpful is when you're at the airport or flying. So really I'd rather forgo all the miles and have weekends instead of weekly travel days, but what can you do. The Man is worth it (most of the time... wink wink), and for the time being we must travel. I typically maintain a pretty balanced diet despite all of the airports and planes- you learn where you can find a vegetable, and that Kit's Organic Clif bars are your saving grace if you have to fly through ATL. And we're usually in Connecticut or Idaho long enough for me to make at least a couple of solid grocery store runs for home-cooked meal ingredients before we have to turn around and leave again. But the last few weeks have blown all norms out the window. When you're only in one place for two full days before driving back to the airport, and the nearest good grocery store is at least 30 minutes away, you barely have enough time to check the mailbox and get your work done, let alone journey to the store. So we've been eating out. A lot. As in, almost exclusively for the last three weeks that these terrible two-day-turnarounds have been happening. Thank goodness I'm in Connecticut for at least a few weeks straight now. I thought my head might pop off. So what did I make for my first real home cooked meal in weeks? I grilled! Whole fish! Fresh local corn! Radicchio and leeks! And I served my Stone Fruit Salsa alongside. IT WAS HEAVENLY! It is my firm belief that a good stone fruit salsa will transform any barbecue from typical to spectacular. It has something do do with the smoky-sweet combo. Anything that comes off the grill with a nice char tastes even more delightful with something sweet to balance the smoke. You can use any stone fruit you like for this salsa, whether it be peaches and pluots like I did here, or plums, nectarines, apricots or cherries. A little crunch and tang from some onion, spice from jalapeño, green from cilantro and acid, and your barbecue transformation is complete. And it really doesn't matter what protein you decide to cook since fruit salsas are amazingly universal. Fish, steak, chicken, lamb, goat, quail... you name it- it all works. Another perk? You can make this ahead so if you're in a rush come barbecue time, simply throw your protein on the grill, make a quick green salad, and pull your salsa out of the fridge. Dinner is served. Combine all ingredients in a bowl. Toss, and taste. Add additional salt and pepper as needed. Let sit for 30 minutes (or longer) before serving. As I've said before, Santa Rosa Seafood has the freshest fish around, which is reflected in the popularity of its stand at the market. Don't let the lines deter you! The amazing owners and employees are efficient, and it is well worth the wait. It's almost even worth the drive from Idaho! If I'm desperate enough when I return to the Gem State next weekend, maybe I'll give it a try. I've been known to drive out of my way for quality ingredients but this would take the cake. Friday night comes along- "Honey, I'm driving to Marin for some fish! See you tomorrow night!" Let's hope I don't get that obsessed. For the Man's sake at least, if not for my own. But regardless of location, if you have fresh tuna available to you, and you need to cook a meal quickly on the fly, searing Ahi is a great choice because it doesn't need to marinate and cooks up in just a few minutes per side. Which also makes it an excellent dish for those beautiful warm days when all of a sudden it's 9 pm and you need to get dinner on the table pronto. My trick to turning a simply grilled protein into an exciting meal is an inventive salsa. A fruit salsa pairs nicely with most fish and meats, but this time I felt like something savory. The creaminess of the avocado marries beautifully with the creamy tuna, and the salty capers and acidic lemon juice balance it all out. I love to serve this dish with a radicchio salad because it has a slightly bitter bite to it. I'll share my favorite soon. Here's a sneak peak... But you could also serve it on a bun or grilled bread for a delicious burger or sandwich. Add all ingredients except the tuna to a bowl. Stir to combine and set aside to let the salsa flavors meld while you handle your fish. Heat the grill over high. (Or if you don't have access to a grill, splash some olive oil in a skillet, and sear the Ahi stovetop, uncovered, over high heat.) Rub the tuna steaks with olive oil, and sprinkle both sides with sea salt and freshly ground black pepper. Place on the grill, lower the lid, and cook for 2-3 minutes per side depending on the thickness of the fish. You want to sear the tuna, not cook it all the way through. Transfer the fish to a cutting board and slice against the grain. Spoon the avocado salsa on top, and serve. The Man is one of those people who attacks life with complete enthusiasm, even if he has never done something before. And the other day he was determined to help cook dinner. It's not as though the Man has never been in the kitchen. Right after we met he made me an amazing breakfast of roast squash and apples with avocado and cilantro. It was truly one of my favorite meals I've ever eaten. So he can cook. And makes a point of telling me how he has made more pancakes than I have every time he walks in the kitchen on a weekend morning. But typically I'm the one wearing the apron. So he wanted to help cook dinner. And after asking what I was making, he immediately opened the spice cabinet and started throwing things in a pan. Onions and garlic were flying, and next thing I knew there was this beautifully fragrant concoction in a cast iron on the stove. And not only was it delicious, it went perfectly with the meal I was preparing. That's how the Man rolls- he walks into a situation completely blind, and knocks it out of the park last minute. It's impressive. And okay fine, a little frustrating and perplexing to me. But very impressive. After determining his "Ashkenazi Jam" blogworthy (the Man and his siblings recently discovered their previously unknown Jewish heritage, and have been very excited to work it in wherever possible - I retitled his recipe to make it slightly more descriptive of the food) he spent the next 15 minutes chronicling his process and determining suitable wine, beer and spirit pairings. I have made subtle edits but this recipe is his. Note: The compote is shown above with my Garlic and Herb Chicken Thighs, spinach cake with currants and pine nuts, and ginger maple glazed carrots and parsnips. Second note: As this recipe is a recollection the Man "completely winging it" in the kitchen, he suggests that you take the measurements as a rough guide. Channel the Man, and fly by the seat of your pants. Preheat the oven to 300 degrees. Combine spices on a small tray and roast until toasty and fragrant. Set aside. Now your kitchen will smell good. Heat a splash of olive oil in a large cast iron pan over medium. Add the onions, shallots, and garlic, and toast them, stirring frequently. It's okay to have some blackened edges. Add the spice mixture and stir. Moisten the mixture with a couple more tablespoons of olive oil, and allow the onions to caramelize and simmer down. Add a splash of Saba along with the currants and stir. Part the mixture to one side of the pan and add your pecans to the empty side. Smash the nuts with a metal spatula until well crushed before stirring them in with the onions. Serve with Tzatziki and naan, if desired. Drink pairings: rosé wine, light Asian beer such as Singha, or Armagnac. When I come across a recipe, I tend to be pretty good at determining whether or not it's going to be tasty by reading the ingredients and directions. Earlier this week I tried a salad recipe I found that sounded good in theory, but all of the flavors were a complete disaster together. Even the dressing was lousy. While my lunch that day was somewhat mediocre, there was a silver lining in that I salvaged the remaining dressing and turned it into something delicious. The next day I tossed it with butter lettuce, roast veggies and toasted nuts for a much improved salad lunch! Or you could use it as a dip! Combine ingredients in a small bowl and whisk until smooth.